Gehl Architects, Urban Quality Consultants is a consultancy organization based out of Copenhagen, Denmark, who manages a blog all about the issues relating to quality of life in cities. They want to build intelligent cities to improve the quality of life for those who live there. This infographic from their blog explains some of what they are working to fix. There has been a decline in the number of children biking to school, while the number of children being driven to school is increasing along with the prevalence of obesity in children. 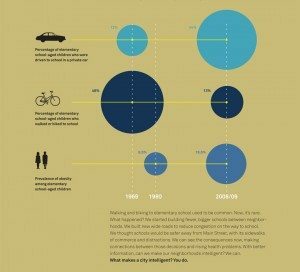 Why aren’t children walking or biking to school? Because they live too far, they have to cross busy streets or pass through unsafe neighborhoods. What are changes that could be made to your town that could make it safe for children to walk or bike to school again? Check out this BLOG for more information, and tell us how your town could and should be changed to improve the quality of life.